I couldn’t resist trying one on. I’ve been bridesmaid twice now, and will be once more in Oct 2014 and again in April 2015 and know how much hassle it has been finding bridesmaid dresses to fit and suit the entire bridal party. Me as Maid of Honour at Hollie’s wedding in October 2009. Hollie is also my MOH. 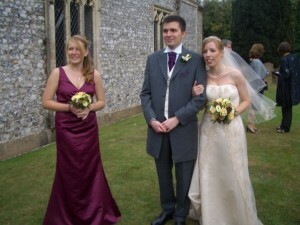 As bridesmaid at Amanda’s wedding in Oct 2011. Amanda is going to be one of my bridesmaids, and so is Zoe, who is stood to my left in this picture. I fell in love with the Two Birds dresses online, as they enabled everyone to have the same dress, but to wear it in one of fifteen different styles. They were so expensive at £250 each, and I knew I couldn’t ask the four girls to buy them. 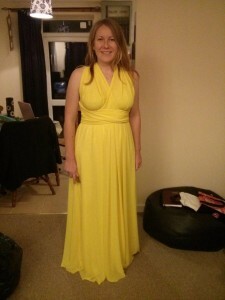 (I’ve bought my own dresses for all weddings where I have been bridesmaid, but never spent more than £125.) So instead I shopped around and found on ebay a seller abroad who was making the same style dress for just £62 each. I let the girls know that I would buy their dresses and then would want them back afterwards to sell on as a set, keeping one for me as I loved them so much! This weekend I have handed out dresses to bridesmaids and I’m now eagerly waiting to see what they think! Dan’s Mum has offered to adjust any that are too large or long. I know two of them will definitely have to go up a little. Then on Friday I got the phone call to say that my wedding dress had arrived in the shop…two months early! 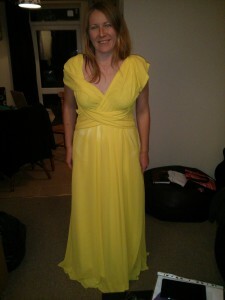 So once I have found some shoes – this will be a mission – I am welcome to go and have my first fitting with my dress on! 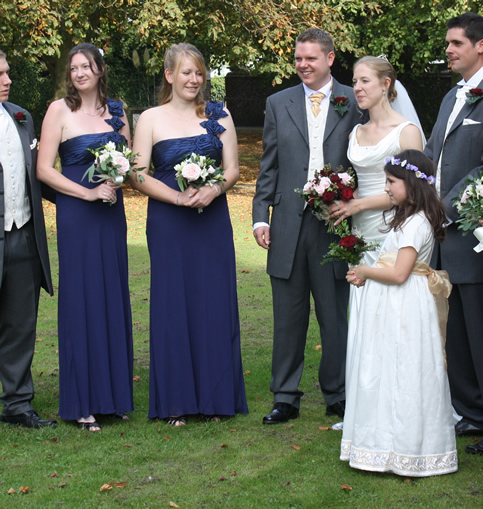 I only had one bridesmaid as otherwise it would have meant 5 bridesmaids to avoid snubbing someone. I just had my sister and then my girlfriends as guests. It was so much easier finding a dress for my sister as I dragged her to town and played dress up in different shops with her haha. That sounds like fun heading out with your sister into town for dress up! I was in a similar situation regarding numbers. Ideally I was after three bridesmaids but I couldn’t have left any of these girls out, so four it was!